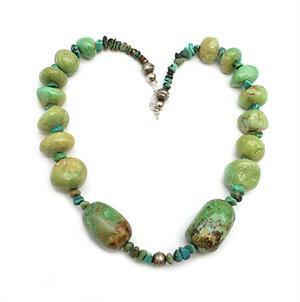 This necklace is strung with large Mojave turquoise and small Chinese turquoise nuggets with oxidized sterling silver beads and hook and eye. It measures approximately 18" long and is strung by Navajo artisan Sandra Francisco. Largest nugget measure 1" long by 5/8" wide. Only this one available.